At 69, I am beginning my second marriage to a two wheeled escape machine. I owned many bikes, from 16 inch to 26, but none for more than two years. My first serious encounter was with a Diamond Back Topanga, in 1995. 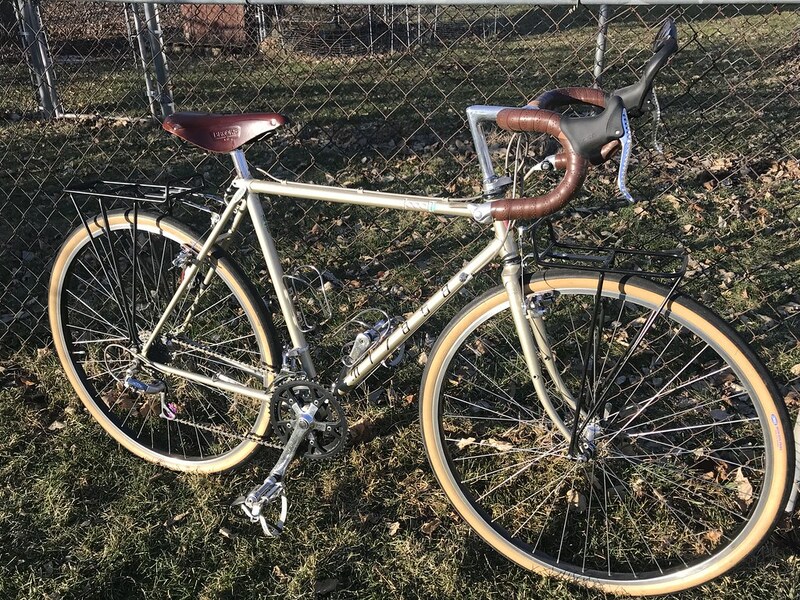 I rode, nursed and rebuilt it for 20 years before everything gave up at once. It was well prepared, sealed bearings on Saturnae wheels and crank. Pretty heavy, solid built hardtail. After shopping around I settled for the Diamond Back Wildwood. A little more up right and shorter frame. Front shock and seatpost makes a big difference for the older set. I ride a minimum of 100 miles a week and maybe 10 to 15 doing errands. The recreational aspect is alluring for me, paved or dirt. No cars if at all possible, can't win in a fight. I agree. I'm 64 and I've had the same epiphany. I agree, you can always modernize any vintage machinery to make it more usable, let the next care-taker, or steward, return it to original specs if they so wish. The world has lost nothing. The owner of my LBS frequently gets great old bikes handed to him on a plate. He checks to be sure a bike isn't stolen, but for odd reasons, sometimes customers just want quickly rid of a bike they might sell for serious $$$ if they were willing to go to the trouble. PX10 in good shape early 2018, and, springtime, a late 70s Fuji Newest, in wonderful condition. He updated a lot of the components and took it to France to ride there. That's a bike far more valuable then the Miyata tourer, but, you know, he was a semi-pro racer in his young days and a bike is for riding as far and as fast as you can. This is my Miyata 1000. I've had it since 1995. Just did the second paint job on it. It gets ridden a lot - rides like a touring bike, handles like a road bike. I love this bike but I love riding more. I'm not here for the bike, the bike is here for ME! All the components except the handlebars and brake levers have been upgraded - I have absolutely no intention of keeping it vintage. I hope this helps you with your genuine problem. If you don't ride it you can still enjoy polishing it, looking at it, etc. Like a nice painting or sculpture. Then, when you die, get desperate for money, or lose your taste and get some monstrous newfangled black anodized and plastic thing you can pass it on, and that'll be one more old bike that's still around in nice condition from the old days. Nothing wrong with 'stewarding' the bikes so some still exist in good shape 10, 20, 50 years down the line. Plus, maybe the most fun was in restoration. If it never gets ridden until 2059 think of how rare & how great it'll look then! Just don't think of it as an 'investment'! Yes, barend shifters are nice when I have a load and I'm in a situation where I want both hands on the handlebars. And it's much easier to use both shifters at the same time! If those are 700c wheels it does certainly have nice long chainstays. From the late 60s to the first few years of the 2000s bike theft here in NYC was at insane levels. 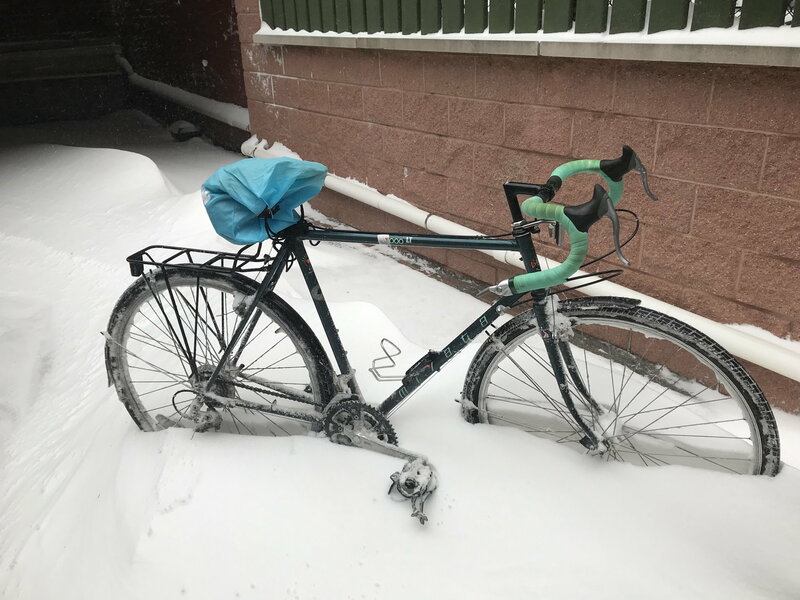 The inhibition against owning and everyday-local-riding a v. nice bicycle wasn't so much damaging it as seeing the bike, or important, expensive parts of it, disappear while one ran indoors to do an errand. This still happens, of course, but incidences are so much fewer now that many bike owners lock their machines outside their buildings rather than bring than inside, which you didn't dare to do 30 years ago. A corollary is that today I feel safe from theft riding anywhere in the city, even at night, when in 1985 there were many neighborhoods it was a strong risk of being jumped, or having glass bottles thrown at me. So I guess the connection to the original post is, just dealing with wear and tear or even accidental damage is such an improvement. 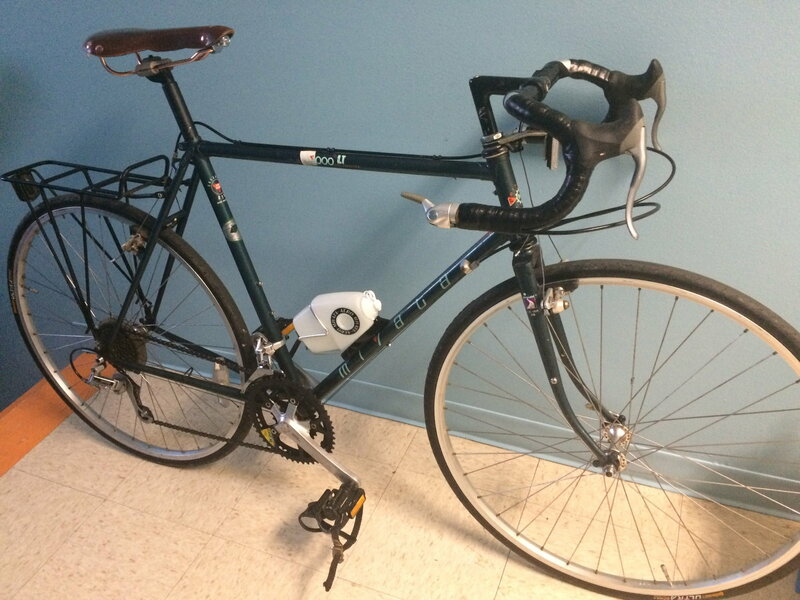 Here's my Miyata 1000, a '91 LT. You can see I'm taking very good care of it! Very nice. Those bikes are as hot as Dutch Tulips these days. I hope the popularity doesn't make other Miyatas expensive too, I kinda like still finding old 712's and 912's for under $150 occasionally. But a 1000? Not a chance. That's pretty slick- is that an 83-ish? A 1990 Miyata 1000LT- I paid too much for it- but I had gotten the rug pulled out from me while trying to by a few other M1000s. It wasn't in quite as good of shape as it looked in the pix- but I was planning on redoing it anyway. I love seeing all these touring bikes and M1000s being put to good use. There truly is no need to keep it indoors when it's meant to be enjoyed. How does your M1000 ride with the modifications, especially with Compass tires? I'm strongly considering making the switch to 700c to get them. Prior to getting the Compass tires- I used Paselas- 1 1/8", 1 1/4" in 27" tires, and 28 and 32 in 700C tires- as well as the Sand Canyon 1 3/8" tires. I always rode them within 10 lbs of the pressure on the sidewall. When I got the Compass tires- I'd been told by everybody and their mom to ride them way lower than you'd think you would ever go- and a couple of people told me to start at 45 and go from there. That sounds like recipe for failure- pinch flats and cartoonish bulging tires- but I trusted the advice of one guy. I rode them at 45 and it was great. They didn't bulge out like I thought they would; they weren't slinky around corners like I knew they would be- and they were absolutely cushier than any of the other tires I'd used- and didn't seem to be sluggish- like you're pulling that casing across the pavement. I ride them around 40 or so now. I had to have some work done to the bike (I misadjusted the RD and bad **** happened).... when I got it back- they had pumped up the tires to the capacity- I think it's 80 on the sidewall... OMG they were cartoon 1940s tires- bouncing around and really really kreepy. My experience with the Compass tires has me wanting to change over my 27" bikes- just for those tires. (I did my Trek 720 first, I bought the M1000 with 700c, and I had a wheel set built for my Trek 620). My Trek 620 wheels are awesome and beautiful- it's really hard to do this- but it's SO worth it. People yammer on about 'Jan's snake oil' and such- there's people that "don't believe" running low pressure, supple tires can be supremely comfortable and efficient... whatever- I got the tires- I liked them enough to not change them, when I got a bike that had 700c wheels- I got the Compass tires for it, and now I'm replacing a wheel set partially so I can use Compass tires on that bike. I got it used at a yard sale in 1995. The folks there said it was their son's and he left it there telling them to sell it in their yard sale with no information forthcoming about what year. I brought it home and according to the serial number the frame was built in 1980. So it could be either an 80 or an 81 model. Thanks for asking. Yes, 700c, upgraded from 27-1/4". I enjoy the long wheelbase on long rides - especially with a load of groceries! HAH! So true, my friend. a touring bike had a compliant super nice ride unloaded. I felt like I wasn't giving up much opposed to a road model but gaining a lot more in comfort . 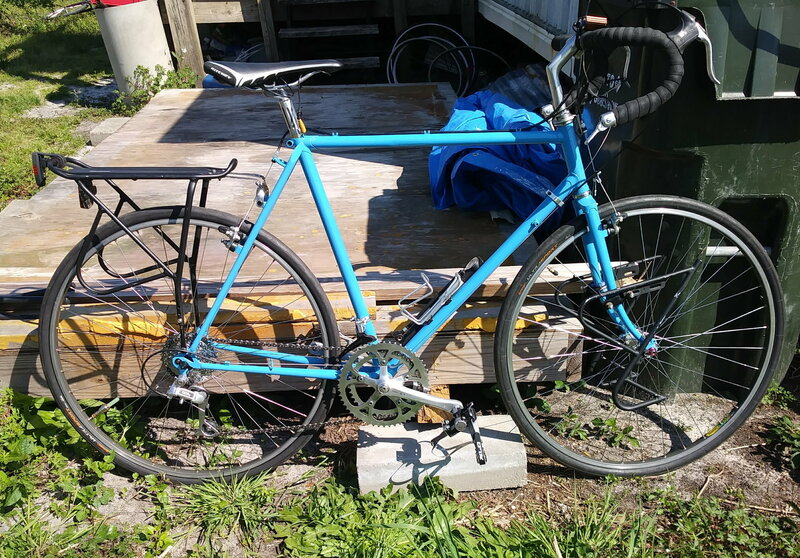 Since it was a size too large I passed it on bto a new owner and now ride a 1986 Schwinn Passage which has a quite similar ride to my former Miyata 1000. 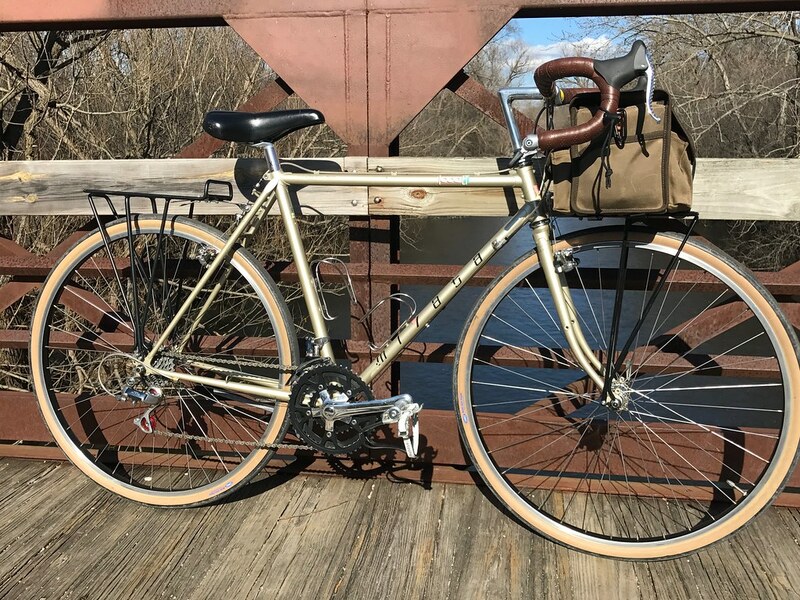 The Passage shares some similarity to a Schwinn Voyageur of which I've also had two of them and they are also great vintage touring bikes. My 86 Miyata 1000 came with 700c wheels but the Passage had 27". I've switched it to 700c. Great insight with this statement sharpywarpy, I totally agree. "​I love this bike but I love riding more. I'm not here for the bike, the bike is here for ME!" I'm repeating myself a bit from a previous comment most likely. The only original components left on my Passage are the cantilevers and the Sachs DT shifters now mounted on Paul Thumbies. If vintage Suntour XC Pro canti's I recenty bought will fit only the DT shifters will be left as original parts. Sheldon Brown's comments probably elevated it ,at least price wise, above the others but there are quite a few great vintage touring models out there including the fine Trek models. If something ever happens to your 1000 there are other worthy vintage touring bikes out there. 83 Specialized Expedition and I don't know what more one could ask of a tour bike . Also what others mentioned about quality tires, what a significant difference they make, definitely worth the extra dollars. Safe pedaling to you all. Last edited by cooperryder; 03-22-19 at 08:20 AM. As desirable the Miyata 1000 may be, they can still be found for about half of what you would pay for a new Trek 520. And if you are willing to pay FMV, they are readily available on eBay. They are hard hard to find locally, at least where I live. But I have found two over the years at ridiculously low prices. 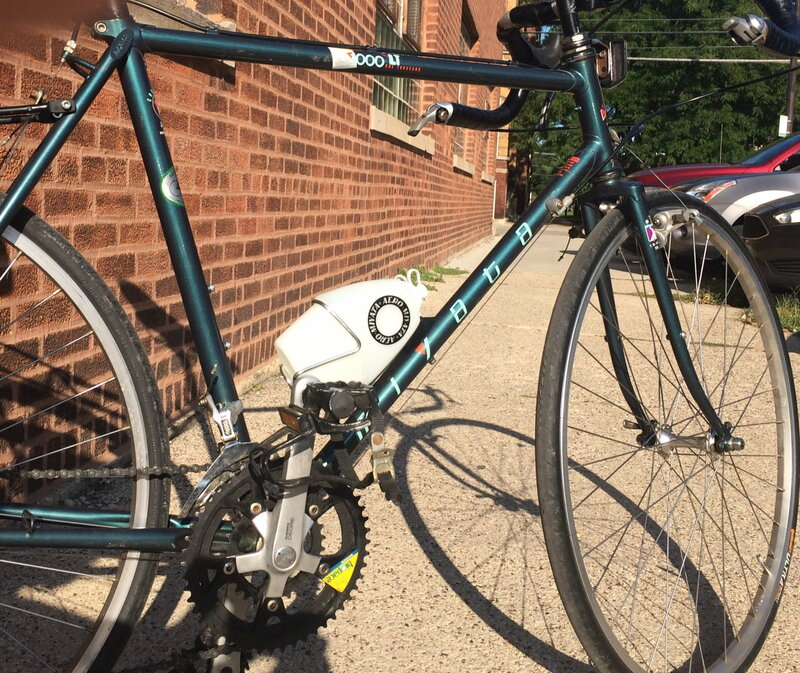 Replace the name Miyata 1000 with a new Surly LHT, or a Trek 520, or a Bianchi Volpe. Few would be worried about riding any of these new touring bikes, all would cost more. It is the bike, you love it, but it will be your memories on the bike that give it any value more than a stack of dollar bills. Riding that bike to Vancouver this summer will both change you and change your experience of this bike forever. The hard days, the head winds, the things that broke and got repaired the grime and signs of wear/use. And once you are done, you will be ready to travel together again and every trip will bring more meaning to your life and store memories inside this bike, such that some future day as you are old, just riding a local trail together will fill you again with all those journey's, and that, that is priceless. I've had this thought for a book title for a little while: All My Favorite Bikes Have Top Tube Dents. I encourage you to ride your 1000! Had an '82 myself and it was very very nice. Well made (and well-repaired) with a sublime ride quality. Light enough, but never fragile, and I had a 63cm version. It takes a lot to ruin steel, or to even get to a point of Ship of Theseus. Easily repaired, and for not that much. It can be repainted or powder coated (for a lot less). Most of my fleet very much outclasses my ability to ride/race. I mean, I can hustle and climb and sprint alright for a short amount of time, but still. A Guerciotti Super Record??? How do I own one of those? Or a Davidson, or a Masi or a Paramount (or two) or anything else? I hop on a bike and we partner in wherever we go. We get to know each other and become friends (yes, an inanimate object!). Get to know your Miyata. Not that it will make you care less about it or care less when it gets scratched, but man, man and machine is really cool. I am beyond over the whole collector car craze and old cars being sold for a zillion dollars. Practically speaking, you could make that $12M Ferrari with newer and better metal, more accurately, with more durability and safety, for a lot less than $12M. That old car could burn to the freaking ground, and all it's done for the last four decades is be driven (or pushed) from storage to a trailer and back. Another title transferred, another owner who stores it some place else and never drives it. That is sad as can be. Drive something that is meant to be driven. Ride something that is meant to be ridden. W.O. Bentley-era Bentleys get very much driven by their owners, and those things are priceless. Repairs? Maintenance? Yup. Par for the course. Well then. Waiting for my new to me vintage Bob Jackson campagnolo super record, Reynolds 753. Hope to be riding it as much as I drive my Bentley Continental GT. only the DT shifters will be left as original parts. But those shifters from the Passage are those really cool, and fairly rare, Sachs/Huret ratcheting shifters with the buttery smooth action!